The Fundraiser for Autism, 2011 is now over!! Thanks to all that donated!! The fundraiser for 2013 starts in APRIL! For 4th year in a row I want to thank you for taking the time to stop by and for considering a donation. I would ask that if you do not donate here, that you consider doing it somewhere else. You might even donate some time to something local in your own community? Every year I say this is the last one and for the last three years I have been encouraged to do it "One More Time" by some of my closest friends and even some strangers. So here I am, one more time and I think you for joining me, one more time. To answer a question that I was asked last year, no, I do not keep any money from the fundraiser. 100% of the money raised at the end is sent to the Institute for Autism. http://www.autism.com I try to practice full discloser. There will be a page showing amounts donated and I will do my best to update that page daily. First, I would like to thank two wonderful friends that came though and donated something to have for a drawing at the end of all this. Last year I covered the largest part of the eFX Tircorder out of pocket but this year, well I could not afford something so nice. When my friends heard I needed something, they scrambled to make sure there was something. So, once again, I am blessed to have such wonderful friends. And last but not least, the many many people that donated last year. You together, and individually, inspired me to do this again. How do the donations get turned into entries for the drawing? When will the drawing be held and how will I claim my prize? The drawing will be held on May 1st 2011. The winning numbers will come from the random number generator at http://www.random.org/ The first number generated will be the first place, the second number generated will be second place, and so on. The winners will be contacted by the fastest means possible. The winner's prizes will be shipped out to their PayPal confirmed address only. Yeah but what could I win? 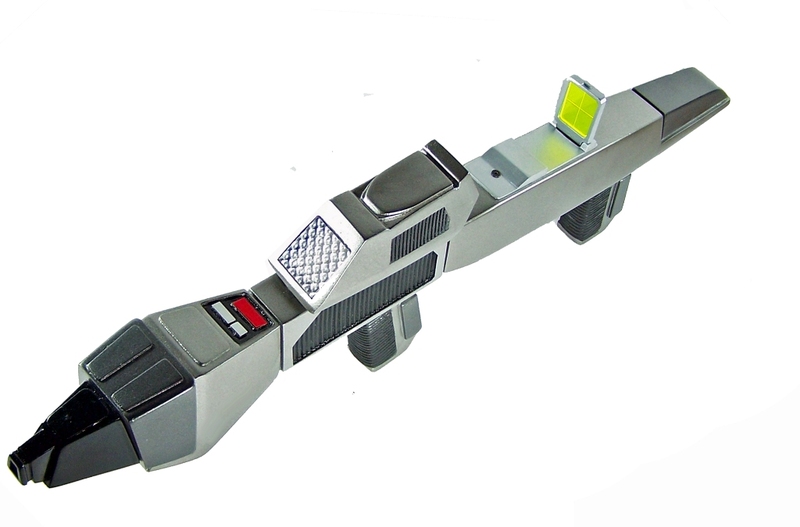 Seen in TNG and DS9, the Type III Phaser rifle. The scope on the top lights up due to a hidden switch on the back side. A Kim Lockman CLICK ME signed print of her painting, "Desperation in His Eyes". You should click the link and check out some of her other wonderful paintings. I believe this is the 14" X 10.38" version. Money donated to the Autism 2011 Fundraiser is not refundable. Drawing will be held Mat 1st, 2011. Each participant may only win one prize. Donations must be made through PayPal. We feel this is the safest way to conduct this. This way, everyone has a receipt for all money received and money donated to the Autism Research Institute. A link to the receipt for the total amount sent to the Autism Research Institute will be posted on this page once the amount is forwarded on to the Autism Research Institute. To be eligible for the drawing, you must donate through us so that we can keep records of the transactions and have a verified address to ship the prizes to, should you win. This also gives us the number of entries in your name for the drawing. If you do not care to be entered in the drawing, then by all means please donate directly if that is your wish. If not to the Autism Research Institute, then some other Autism charity. You might even consider donating your time to something local to you? Donations made to the Trek Toy Forth Annual Charity Fundraiser are not tax deductible. We are NOT a Not For Profit Org. If you must have the tax deduction (and that is understandable) please donate directly to the Autism Research Institute (or perhaps a local institution where you live) however you will not be in the drawing. If you are under the age of 18, we insist that you get your parents’ or your guardian’s permission. The laws concerning donations or drawings of this kind where you live, If you are in doubt, then please check, and if it breaks laws where you live, DO NOT donate. If you have any questions about anything, then please email us at Click Me before you donate. CLICK HERE FOR THE CURRENT TOTAL. section, you don't have to be a member just to say hello.